November 1, 2016 : A victory by Democratic presidential candidate Hillary Clinton next month would add one more name to the list of the fewer than two dozen female heads of state and prime ministers in the world. But the number of women in high-ranking positions — ministers, governors, parliament members and CEOs — is growing. And despite the different cultural and political backgrounds among those powerful women, there are striking similarities among them, according to researcher Susan Madsen, who studies the development of prominent female leaders in the United States and other countries. Female leaders are raised in a similar family environment, according to Madsen. Susan Madsen, who teaches at Utah Valley University, says women’s approach to leadership is different than men’s. “Generally speaking, women are just more collaborative,” she said. They were also encouraged to listen thoughtfully to others. In addition, Madsen found that most prominent female leaders used to play team sports. 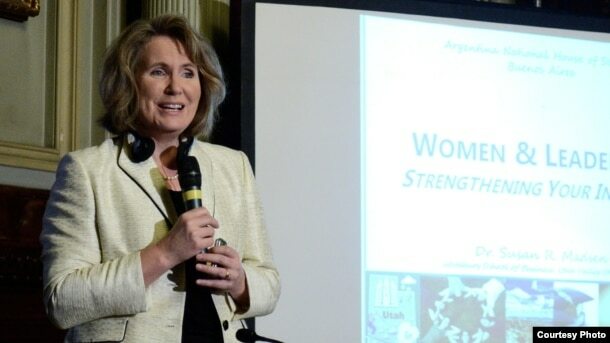 Madsen, who teaches management classes, also serves as a director for several women’s advocacy organizations, including the Utah Women and Education Initiative and the Utah Women and Leadership Project. She noted that women’s approach to leadership is different than men’s. FILE – Young women listen to first lady Michelle Obama speak during a campaign rally for Democratic presidential candidate Hillary Clinton in Manchester, N.H., Oct. 13, 2016. Researcher Susan Madsen says women who have risen to positions of power have a common responsibility: leading by example, and inspiring the next generation of female leaders. “Generally speaking, women are just more collaborative,” she said. “They really listen better. Research has shown women actually observe nonverbal behaviors better than men. They see more subtle things that are happening and can adjust and adapt, and really bring other people into the conversations. But there are common obstacles that often keep women from playing a more prominent role in their societies, Madsen says. “It doesn’t matter the country, it doesn’t matter the income level or cultures — different studies say women have less confidence than men,” Madsen said. “Also, women don’t aspire generally, as much as men, to be leaders. That comes from girls and women not seeing women as leaders. The social norm is that men should be leaders more than women, just because that’s how it’s been done for years. To change that mindset, Madsen says, societies have to remove some of the hurdles that stand in the way of female empowerment. “We have to help girls and women understand the importance of becoming a leader,” she explained. “We’ve got to teach them that they actually can be leaders and they actually should be leaders.